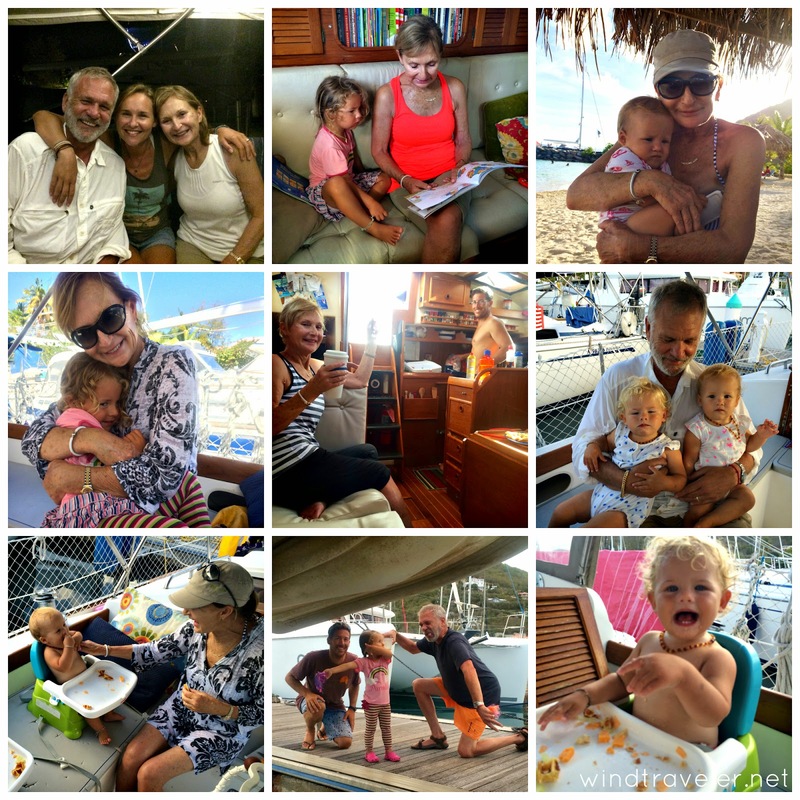 Windtraveler: Grandparents, Marinas and Projects, OH MY! Grandparents, Marinas and Projects, OH MY! My parents arrived last week which was a pretty big event around here. Isla has been excitedly telling anyone who will listen about their impeding arrival for weeks, so to have them here in the flesh made her positively bubble over with joy. Their arrival has meant a lot of things; getting spoiled by meals off the boat, extra hands to help wrangle babies, great talks over wine when the kids are asleep, and the appreciated perks of marina living. Because our boat is pretty much maxed out on space with our family of five, we don't have room for guests to stay aboard (except for my sister, who's the best boat guest ever). As such, we have returned to our "home away from home" at the Nanny Cay Marina where my parents can enjoy their own hotel room only steps away from our boat in her slip. This beautiful marina boasts a beach, a pool, a coffee shop, two restaurants, a beach bar, a chandlery, grocery store and more - so everything we need is right here. The convenience cannot be beat, and with three small children convenience is a must. It's certainly much more pleasant than cramming four adults and three kids onto our boat at anchor, and the perks of being at a marina are wonderful: unlimited power and the ability to charge anything whenever we want (and not just while the generator is running), luxurious long, warm showers (not cold ocean showers followed by a fresh water rinse off the back of our boat), and wide, paved sidewalks on which to use our umbrella strollers (with these snappy stroller connectors which make two strollers one) to take the girls on walks, which they love. Of course, this all comes at a cost, $1.40 per foot per night to be exact, but for a week here and there, it's a nice change of pace. But marina time isn't all about fun and games, it is also synonymous with work. I have been wanting to tackle some sewing projects for a while, but nap times, bedtimes, three small children running around and inadequate space free from tiny prying hands were inhibiting my ability to get anything done. My parents' hotel room turned into the perfect work shop for me. 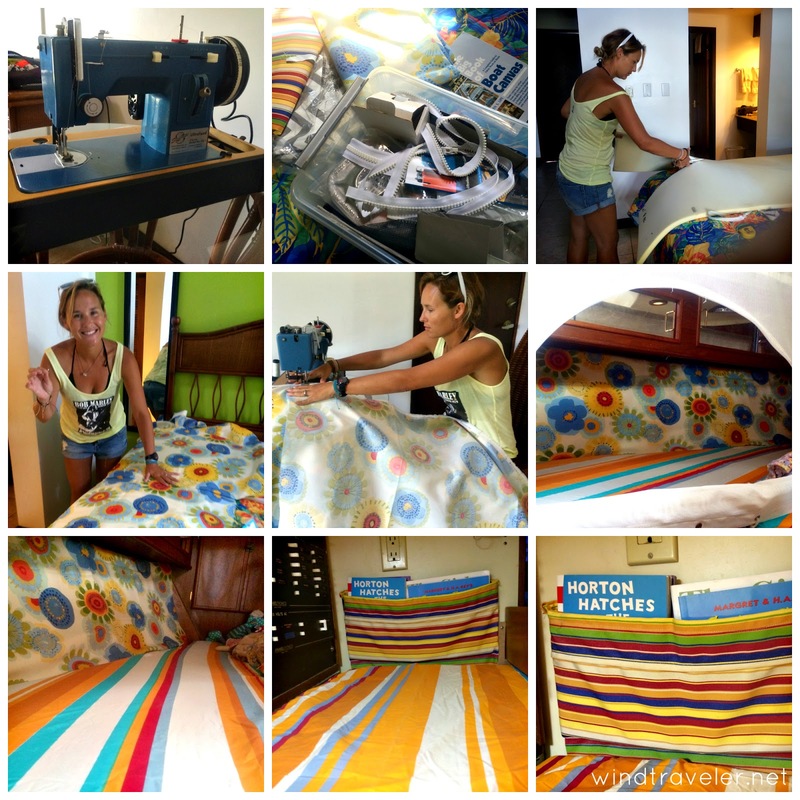 I brought out our awesome Sailrite LZ1 sewing machine and got to work covering a cushion (1 inch foam, $42 for a 30x80 inch piece) for the twin bunk in the v-berth (with the extra I made a new mattress for Isla's bunk as well). While Haven and Mira are more than secure and happy in their cozy room, every now and then Scott and I would hear a loud thud from up there and, depending on whether or not the thud was followed by a wail, we knew it was either their legs or their heads banging. I took care of that with a nice, fitted cushion to soften the blow. Combined with the new sheets I picked up from a local store for $10, I think their room looks bright and fun. 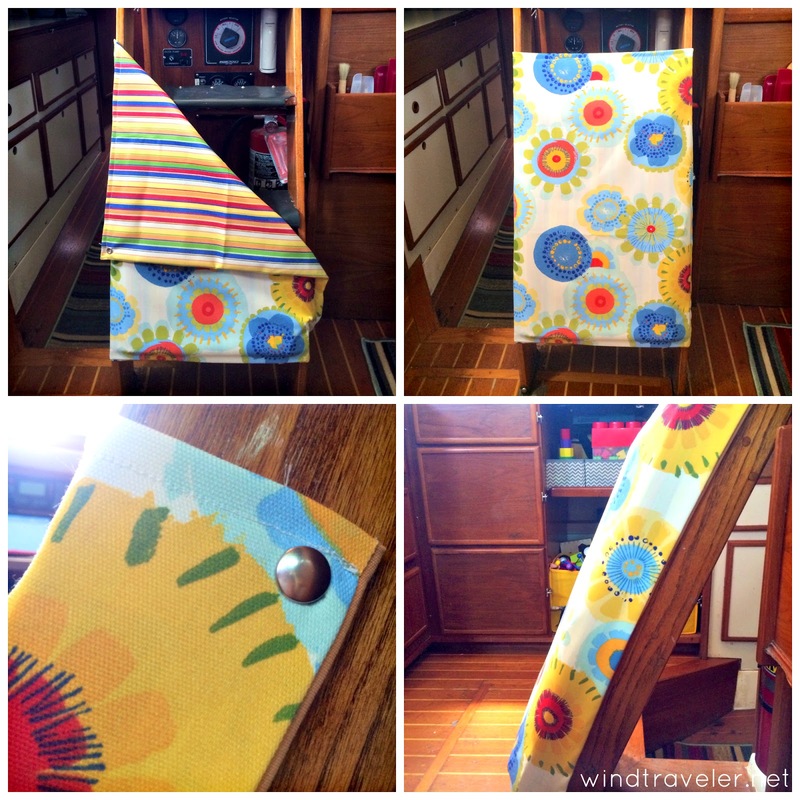 I then made a little book sling for Isla's bunk. While she has loads of books in the book shelf in our main salon, she didn't have any at the ready near her bed. A small pouch affixed to the wall with some industrial strength velcro (sewed onto the back of the sling and then the matching side stuck to the wall) works wonders. She now can entertain herself with books for at least 1/2 hour when she wakes up in the morning (at 6am), meaning mommy and daddy get a few more zzzzz's. That right there is a win. Scott's not slacking either. We have a new thermometer to install on our engine, a leaking mast to re-seal (using Spartite), and a boat that is in desperate need of a good scrub. If there is one thing that you must know before cruising with small children, it's that the window get even the simplest projects completed is hugely reduced, if not closed entirely. Keep this nugget of information in mind if you buy a project boat thinking you can work along the way! Everything, from routine maintenance to unexpected repairs, requires much more time and planning. "Truthfully, Brittany, I don't know how you are doing this. Honest to God." We both had a good laugh at that one and then I went straight to the bar to grab us two painkillers. If I've learned anything being a mom of three little ones, it's that a stiff afternoon cocktail really "takes the edge off." Sad, but true. Don't hate. So, yes, it's been a busy, busy week around here and in between the general mayhem that is our daily life, we are having so much fun hitting up the beach, the pool and - yes - the bar, quite regularly. It's going to be so sad to see my mom leave (dad had to go back yesterday), but we're already looking forward to her next visit. Grandparents are the BEST. Our sons and their babies are not living on a yacht, but even so, I like to think we pull our weight as grandparents. But I'm sure your parents feel the same as us. Being grandparents and spending time looking after our grandkids is one of the best experiences ever!!! What a great idea the cover for the stairs!!! Definitely a must have for the upcoming season with our little 2 years old. Great post! I always enjoy reading your blog and seeing how things are going for you and your little family. We are hauled out at Nanny Caye right now so perhaps we'll run into you at some point. So true about the afternoon cocktail! As a mom of three under three as well (Thomas 2.5yo and twins Ava and Mae 10mo), you absolutely need to take the edge off. Pretty much everyday! But seriously, you are amazing! Love your blog and your adventures. Thank you! We're headed for 5 months in one place for the summer..and I know the "house" projects are going to come crashing in. Brilliant! I don't know why we didn't think of that! I had my husband hinge our companion way stairs to be able to pull them up and keep babies down below. Wish I had thought of stair covers! Our babies are now 3 and 4 and we rarely hinge them the stairs days. Makes it difficult for us big people to get up and down. You're right though. It is important to be able to keep them safely down below. And a marina break every now and again is just lovely. Hi there! So glad we had a chance to hang out with you and the family! Sorry we didn't get a chance to say goodbye, but I got some pictures of you heading out. Hopefully see you in St. John soon! Oh my gosh, thank you so much Brittany, that step cover is genius. My husband and I are trying for a baby and have just had our offer accepted on our 'baby boat'. Baby proofing has been a huge concern but this idea, wow, genius! Also going to get on of those Press-n-Snap tools. Love your blog, you and your little family are a huge inspiration! David Baldacci, part of the FBI task force tries to piece together the reason why Dabney would do such a thing. It is an interesting read bringing the reader into the world of espionage, government secrets and prevention of terrorist attacks. Eva Mattress had been very knowledgeable as well as paid attention to the issues if this came down to purchasing a bed mattress. He didn't pressure us in to not encourage us to try out the different beds while explaining the features as well as benefits of each one. It had been a great encounter for my spouse and that i and we suggest looking at Eva Mattress this Link.